If you’re on twitter you’re probably familiar with people tweeting at you, "pls fbk! Pls fbk! Now following please follow back!" And they always use exclamation marks!!! I liken it to walking on the street and poking strangers saying “be my friend! I’ve just befriended you, friend me back! LOL. Would you do that in “real life”? Then why would you do it online? It’s real people behind handles, real emotions, so you need to be strategic about it. You can get follow backs without hounding or bullying people into doing so. Since I started my , ahem, twitter career, I nor dey do am. If I follow you, it means; I’m interested in your tweets, I like your bio and I want to interact further with you. I knew I was doing good getting follow backs when celebrities like Ali Baba followed me. 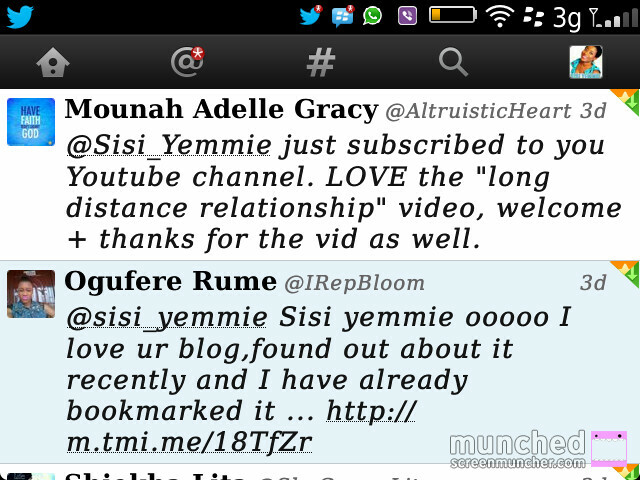 In fact, when Rita Dominic followed me, I knew I had arrived in twitterville! 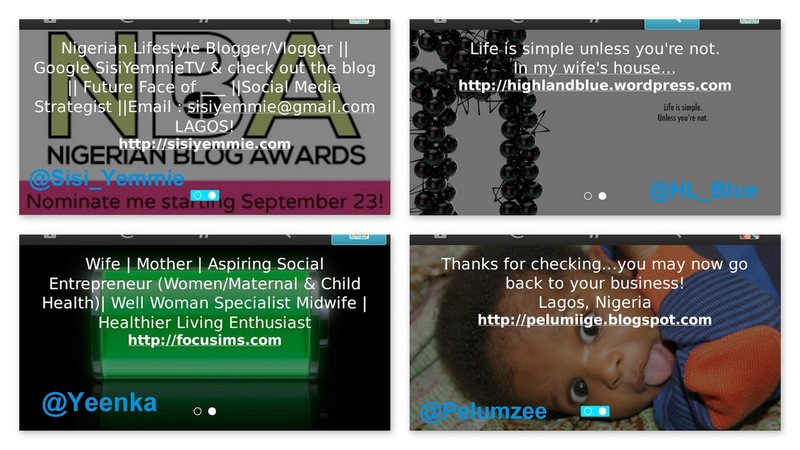 I’m waiting for Oprah, Mo Abudu and so many others to follow me and may my bia bia not grow grey before that happens. BIO: Re-write your bio. Your bio is that space twitter allows you to fill in a summary about yourself. Some bios are creative, funny and some are rude! LOL. I enjoy going through people’s bio. From your bio someone can quickly get quick information about you, your passion, your business. If you dey sell akara, put am there. If you get website, put am there. If you hate bios, put am there! Just make sure it’s not empty. People follow back not mainly because of the number of followers you have but because of the content of your bio. Some guy once tweeted fbk, fbk,fbk till I had to go and look at his bio to decide, when I got there it read “ I HATE BIITCHEESS, PISS ME OFF!! HATE ME LOVE ME!” Emi follow eleyi? Lai lai! CONTENT: Your tweets make up your content. What are you tweeting about? Some people will randomly follow you, others will follow after going through your timeline. If all you tweet is "fbk pls/I hate men/God is not real"….errr I will not be following. Some people na only konji matter dem dey talk day and night! Twitter is a place with influential opinion, whether wrong or right. In as much as there is abundance of free information, I choose what I see because I do not want the wrong things to influence my judgement/lifestyle. Don't join twitter and forget what your mother taught you, don't let peer pressure erase your good morals. What are you tweeting about? Emi o ni follow eni toba’n sepe! someone and expect automatic follow back. Tweet at them, if they ask for opinion, respond. Ask them questions too. Wish your TL a good morning, or goodnight. Anyone you like. Make sure you participate positively. 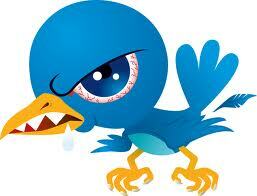 Some people transfer aggression, all others know how to do na twit-fight and cause quarrels. They will cc you for fight. Some na so so gbagaun dem dey see. I rarely go through my followers list and I mostly follow back when a handle keeps interacting (positively) with me. I’m tempted to click on their bio, then I go through their previous tweets and If I like what I see, click! O tan! Lol pls ff back on twitter and instagram us just the absolute worst! Na so one pelzon wey be like my very old uncle bugged and bugged for follow back. I follow finish, bobo enter dm to say "baybay i'm in lag, lets hook up"
ha ha ha... kia kia! unfollow and block! you are right. I re-wrote my bio two weeks ago and I've been getting worthwhile followers. Awesome! You bio helps you connect with like minds! @toinlicious...lmao. there are so many creepy people on social networks. Lool you are hilarious !! There was this person i was following and the tweets were like 20 per minute. very random, staccato, and most times overly sexual tweets. I had to unfollow, even after I tried to tolerate for a while because I know the person in real life. My spirit couldn't take it any longer abeg. Unfollow abeg, end time is near. I think i've been in that situation, at a point I asked myself, "when did I follow this person???? 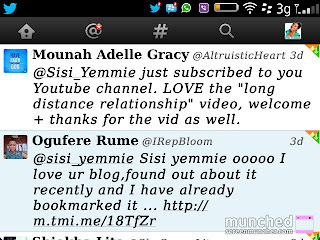 I'm with you Sisi Yemmie! LOL @ "mi o le follow eni to ba n s'epe"! Too right! That is how one young girl asked for a follow, I did (as always) and she sent me a DM full of swear words, asking for weightloss advice, I ignored the swearing and answered politely but when I realised that's what she was all about; raunchy avis and constant swearing and so on, I quickly unfollowed, no guilt! lol... you know say small children nor get respect online, lol. I had to feature your bio, it's love ya know! I agree with everything you said! Thank you for subscribing...!I'll defo follow! I totally support you. Twitter can be fun especially with those crazy tweets from peeps you dont wanna mention. How would a babe tweet that 'I am only active at night' She be winch ni? LMAO... na for night she dey fly na. you suppose "code"
Oh this is a lovely post Sisi Yemmie. I am laughing at some of the comments, lol. Me, I no dey even bother with unnecessary follow follow o. Thank you my beautiful Barbie! Social media has really turned the world into a village,people feel they are close because they read, stalk or follow people on social media. I am not a big fan of twitter but after reading this post, I think I will give it a try. You're correct. Social media can be good, or bad, it depends on how it is used. Please sign up for twitter and join the conversation! I so so love this post hun! 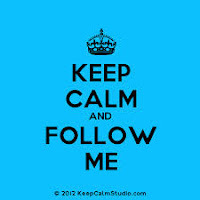 and totally with you on people saying "Please follow back",lol! Girrrrlllll, I have a post sitting in draft for people who request follow backs on Twitter. I'll get to it one of these days. Lol. Fun read. Some people order u to follow back when they aren't even following. Some clown I do not know from Adam tweeted at me the other day "ff back iyawo" and I began to wonder when he wifed me. Ha. Great job though. U can't impose on people to follow back. Your TL should be worth it. If your bio tells me nothing about u and I do not know u, I'm unlikely to follow. I must say. I am really bad at interacting on twitter. Twitter hasn't really been my cup of tea. I use it for only publicity. But things changed a bit 2 weeks ago when Naijawife and Naijahusband mistakenly adopted me as their second child. Though I am still quiet on twitter. LOL...don't be quiet on twitter jor. I'm just seeing this! LOL hatty! Our adoption was not mistaken o! We deliberately chose you! hmmmmm na wa..considering two people I have virtually begged for a ffback are on this thread..Vera Ezimora and Sisi Yemmie herself..so I guess I am one of the people wey una dey yab abi..O wa lara yin lol.. Just started using twitter very much like this year despite being on it since 2010 and I had to get back on there due to my blog and all and most times when i follow bloggers I tweet at them so they can ff back.. cos I assume if you have hundred pple ff u in a day you def wont ff all of them back so a shout-out would do and all.. But I guess I was obviously wrong no more asking for ff backs lol.. I have sure gained some twitter tips here as am guilty of just sharing blog stories and Links and not really interacting and saying much.. so Thanks for this Sisi. Nice one Sisi. I need to learn more about social media interaction. You do a great job at it! Great post! but this still doesn't work for me. I think my profile is spot on! 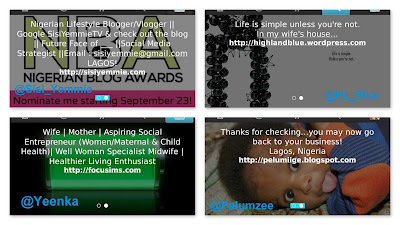 Im a blogger and I like to follow like minded people and bloggers say 'on the same level' as me but nope! I guess i have to have a lot of followers first for me to be important enough lol but then when no one is following it's an annoying cycle.